Quick and safe protection-climbing system with the number of floors covered up to 3.5, and the protection height of 3.4 m.
The working platform is 4 levels. Complete enclosure for the building perimeter, thus, workers feel safe when working inside the cocoon with a proper protection panels. Full access for workers to move between platforms to do formwork, rebar works, and posttensioning system for beam/slab perimeter. 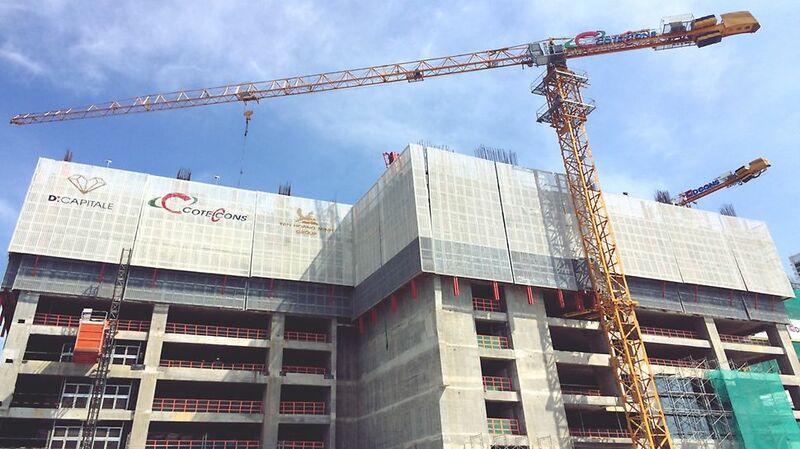 Minimize number of use of tower crane as all the panels are hydraulically climbed up to the casting level. Within 14 to 16 hours after concrete placement, RCS P panels can be hydraulically climbed up. Once the protection panels are in place, concrete and rebar activities inside the building can begin. Therefore, it helps accelerate the progress of work, improve workforce productivity, decrease no. of labors for installation of conventional scaffolding for protection, thus avoid incidents related to falling from the scaffolding.